Roman mythology dominated early ideology in human society. Seeking an explanation for the events that occurred in the world around them, Roman citizens developed a complex hierarchy of gods and goddesses representing both emotions and natural events to explain what they experienced. 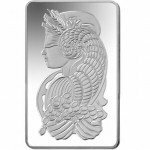 Today, Roman mythology is recalled on numerous precious metal products including PAMP Suisse’s Fortuna line of silver bars. 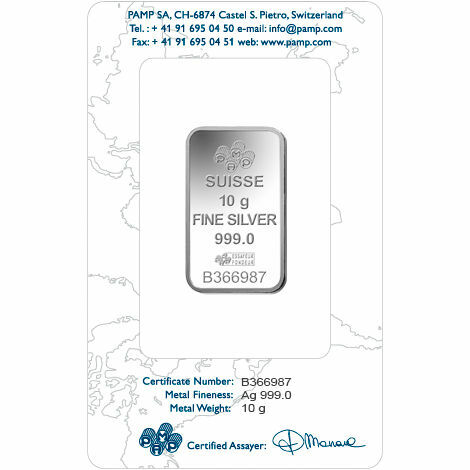 Now, you can own the 10 Gram PAMP Suisse Fortuna Silver Bar in new condition from Silver.com. 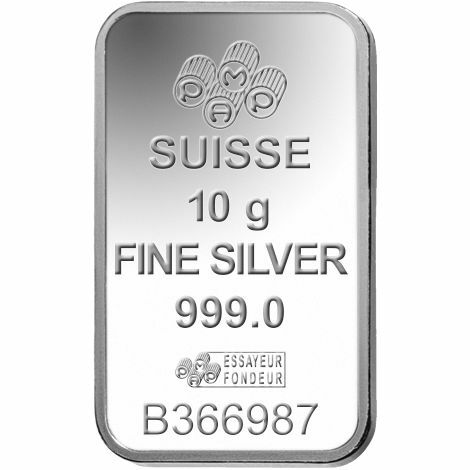 Contains 10 grams of .999 pure silver. Fortuna was the Roman goddess of fortune, also serving as a personification of luck in Roman religion. It was said that Fortuna could bring both good and bad luck to those who worshiped her. She was often depicted with her face hidden by a veil or her eyes covered by a blindfold. This image, used in modern society to depict the fairness of justice, came to represent life’s capriciousness. Her father, Jupiter, was the king of the gods as well as the king of sky and thunder. He was better known as Zeus in Greek mythology. 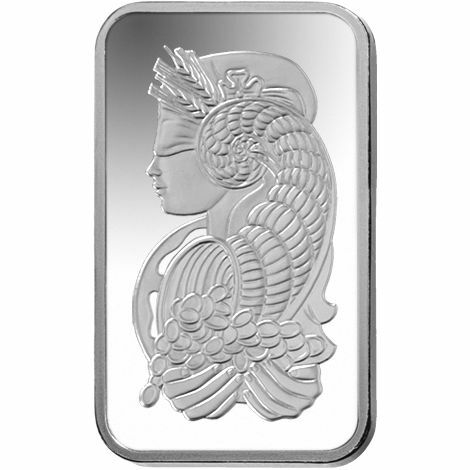 On the primary face of the 10 Gram PAMP Suisse Fortuna Silver bar is the blindfolded depiction of the goddess. Featured in a left-profile portrait, a cornucopia is included on her head with a horn that twists down to her cupped hands. In her hands, a vast amount of wealth pours out of the horn. The opposite side of the silver bar bears engravings that identify the details of the bar and the refinery casting the bar. 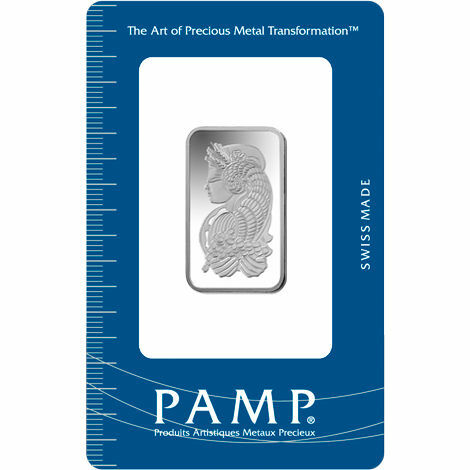 Engravings include, from top to bottom, the corporate logo of PAMP Suisse, the weight, metal content, purity, individual serial number, and assayer’s mark. 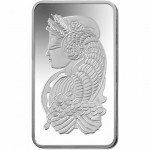 Similar to smaller Fortuna silver bars, the rim of the bar has a pronounced edge that is easily visible. PAMP Suisse was founded in Ticino, Switzerland in 1977 as Produits Artistiques Metaux Precieux. The company is now part of the larger MKS Group, which is based in Geneva, Switzerland. 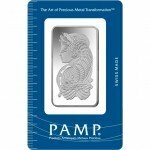 PAMP and the MKS Group represent one of the largest precious metal and financial firms in the world. 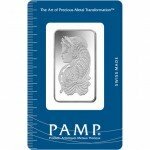 If you have any questions about the 10 Gram PAMP Suisse Fortuna Silver Bar before placing your order, don’t hesitate to contact our associates at 888-989-7223. You can also reach out to us online using the live chat function located on our contact page.